Whitening of the teeth is either done simply at home under the dentist's guidance. With at-home whitening, custom-made whitening trays are made to fit your teeth accurately. The whitening gel is provided with full instructions for home use. On average it takes 14 days. How long does whitening result last? The improvement is permanent. However, the teeth can stain by smoking and by eating some foods and beverages such as coffee and tea. Some clients have a touch up a year or two later with home whitening gel for 2 days. How do I know which whitening products are safe? We only use products with a European CE mark which meet high standards for safety and effectiveness. Provided your teeth are healthy and there are no gum health issues, teeth whitening has a safe record. Healthy teeth during whitening may become sensitive but this usually settles after a day. Patients who opt for the in-surgery "laser" whitening will experience less sensitivity compared to the at-home with trays as the treatment time is shorter. 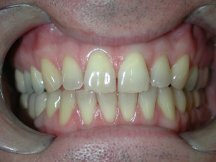 Will my teeth become whiter? Not everyone's teeth will "whiten" the same. Yellowish-hued teeth will whiten well; brownish-coloured teeth will bleach less well and greyish-hued teeth may not whiten well at all. Your dentist can evaluate your situation and give you the best advice. That advice may be to forego a whitening procedure and instead opt for another cosmetic procedure such as porcelain veneers. What about my crowns and fillings? These will not change colour. 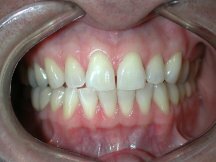 If there is a mismatch in colour after whitening, you may wish to consider upgrading to newer crowns or fillings.